We crave inspiration. When energy is low or there’s a pause in our day, we turn to Facebook, Twitter, or Instagram. But there, stimulation is drowned in exhausting, endless streams of content. DailyModi is a brand new free iPhone app committed to structuring inspiration into bursts of discovery. 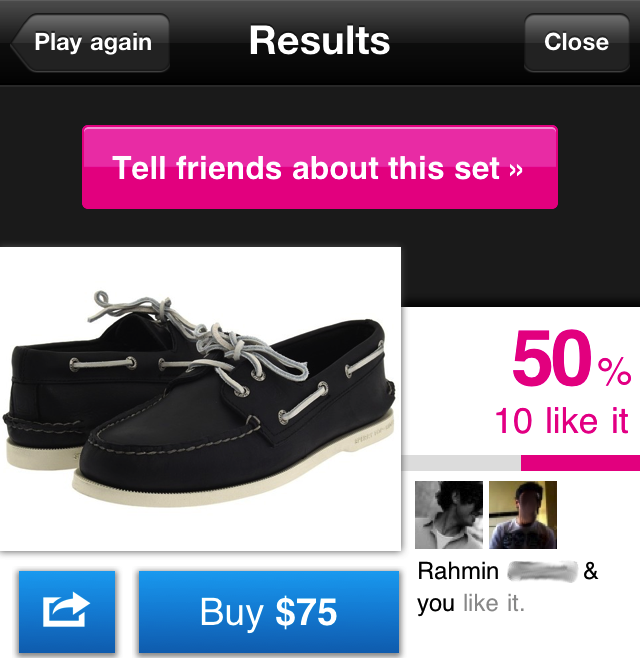 With addictive finger swipes, you rate your way through 3 daily slideshows of paintings, shoes, typography, and more. Compare preferences with friends, and buy or learn about what you like. Leave feeling satisfied, and return tomorrow for more. DailyModi’s co-creator Gregor Hochmuth believes “It’s about creating a daily ritual. You know there’s content waiting for you. And it’s very quick and simple, you can play in two minutes.” Hochmuth explained that sites like Pinterest and FFFOUND are beautiful and different each time you visit, but there’s no prescriptive way to use them. By giving DailyModi more direction — there’s just 3 sets of 20 images to rate each day — the app pairs inspiration discovery with a sense of accomplishment when you complete the available sets. Modi, Inc was founded after Hochmuth, a product manager on Chrome, and the eponymous Shaun Modi, an interaction designer who created the G+ circle editor, both left Google. They first released PlayModi last month, a website that lets you create your own image or text sets, and browse those of others. AirBnB now uses a PlayModi Facebook Page app to let fans rate its top 40 destinations with their arrow keys. However, Hochmuth says “People really like the swipe gesture for rating things” and with the backend in place set out to built their mobile app. With DailyModi, you login through Facebook so it knows your gender and can tailor the fashion sets accordingly. You’re then shown the day’s 3 sets. They’re like slideshows, but you have to swipe up to like or down to dislike in order to proceed. When you complete a set you can share it as well as see the percentage, count, and Facebook friends who liked each image. If enabled, Push notifications improve retention by informing users when new sets have been added. You can then click through to buy the fashion products on sites like Zappos, learn about art and culture images through Pinterest, or just save any of the images to your photo library. This last feature makes DailyModi a killer way to find cool phone wallpapers, especially since all your liked images are collected in a shoebox on the app’s home screen. There’s still some rough edges. Set results take a few seconds to load, and there’s currently no way to share individual images, but these seem easily remedied. Its biggest challenge will be getting users actually make it a ritual, because since it lacks direct communication channels there’s less urgency to open it than a social network. In addition to monetizing through affiliate fees on products bought through the app, Modi has had a lot of interest from brands. They want to use it as a distribution and feedback channel for product promotion and market research. They could pay to offer a branded set, and then use the like and dislike data collected to refine their marketing or design strategies. I can foresee brands being eager to create sets and replace their slideshows with Modi embeds that can collect this valuable data. DailyModi is a breath of fresh air in so many ways. The finite set size keep you from feeling overwhelmed, and the daily turnover prevents guilt. There’s no overt prompts to share or produce content, so there’s no shame in spectating. What’s most innovative is that with DailyModi, inspiration isn’t a side effect of content consumption, it’s the explicit purpose.